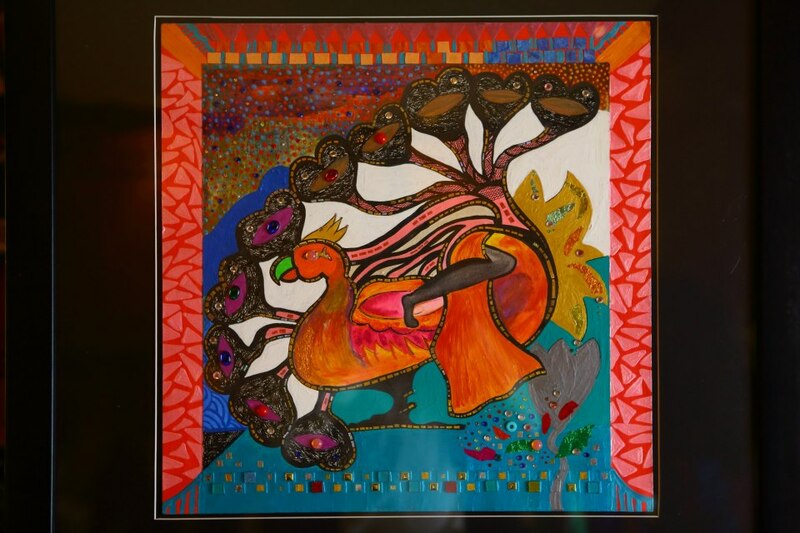 Artists Asma Menon and Olaf van Cleef created an art work titled “You and Me,” currently on view at the Taj Coromandal in Chennai. This Hindu Businessline article, When Chocolate Met Crystal, gives more details on the artwork and the collaboration between Menon and van Cleef. Proceeds from the sale of the work will go to Pondy Citizen’s Action Network (PondyCAN). Thank you to both for their generous donation! This short, two-minute video – “Do Nothing” – offers a humorous view for community engagement while serving as a point of discussion for students and youth to take up responsible action in Pondicherry. As enforcement approaches, the Pondicherry government initiated an awareness campaign for its planned ban on the usage of thin plastics (below 50 microns). The event was led by the Pondicherry Pollution Control Committee with the Department of Science, Technology and Environment. 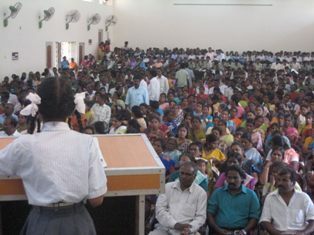 Invitees reached over 1000 persons in a packed conference hall including students, teachers and concerned citizens all listening intently to government officials in their attempt for environmental improvement and change. 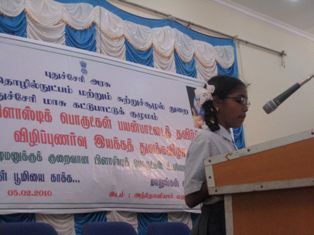 Initiating the program was a young 7th standard JNV student (Adirai) taking the stage. Her poetic recital on climate change, environmental destruction and plastics enthralled the audience; she left the stage to a standing ovation. It was a speech indicating the necessity for immediate action, and its importance for her and the future generation. With weeks remaining on the subsequent ban, awareness needs to be spread across Pondicherry to ensure effective, adequate compliance. Let us hope that the Puducherry Pollution Control Committee (PPCC), which is in charge of implementing this notification, is successful in working with the various stakeholders to create awareness and put in place a monitoring system. The concept for World Oceans Day was proposed in 1992 by the Government of Canada at the Earth Summit in Rio de Janeiro and it had been unofficially celebrated every year since then. Official designation by the U.N. is a significant step in conserving and protecting our world’s ocean. World Oceans Day provides an opportunity each year to celebrate our world oceans and our personal connection to the sea. As of 2009, “World Oceans Day” has been officially declared by the United Nations as June 8th each year! One of PondyCAN’s initial initiative has been to bring back the beach along the Pondicherry coast, on the shores of the Bay of Bengal. This initiative is now expanding its scope to safeguarding the coast of the whole country. It is therefore only natural that we are engaged in the celebrations of the World Oceans Day. We hope you will join us in the pledges we will take on this day. PondyCAN is proud to join leading educational institutions, conservation organizations, and individuals in dozens of countries around the world to celebrate our shared oceans. World Oceans Day – held on June 8 of each year – is an opportunity to celebrate our world oceans and our personal connection to the sea. The Ocean Project, an international network of over 830 aquariums, zoos, museums, and conservation organizations is working closely with the World Ocean Network to coordinate activities worldwide under the theme “helping our climate – helping our ocean” with a special focus on coral reefs. The world’s oceans cover more than 70% of our planet’s surface and the rich web of life they support is the result of hundreds of millions of years of evolution. Nomadic peoples were collecting shellfish and harvesting fish long before the dawn of settled agriculture. Great human civilizations, from the Egyptians to the Polynesians relied on the sea for commerce and transport. In our immediate region, the great Cholas were able to spread their empire across much of the Far East by their close relationship with the sea. Now, at the end of the Twentieth Century, our fate is as tied to the oceans as ever. We still rely on fish for a significant portion of our daily protein needs, and more than $500 billion of the world’s economy is tied to ocean-based industries such as coastal tourism and shipping. Perhaps most important, this vast mass of water acts to help regulate the global climate and to ensure that a constant flow of vital nutrients is cycled throughout the biosphere. But all is not well in the sea. Increased pressures from overfishing, habitat destruction, pollution and the introduction of invasive alien species have combined in recent decades to threaten the diversity of life in estuaries, coastal waters and oceans. Now a new threat, global warming, is making itself felt, and its impacts could be devastating for life in the sea. In addition to this, in our country, man-made beach erosion due to thoughtless planning and improper implementation is causing the sea, our friend, to become our enemy, lashing hard at our villages and towns and cities, turning our water saline and leaving us vulnerable to its waves and storms. And we blame the sea, our friend, instead of opening our eyes and seeing that it is we, through our careless actions, that are responsible. Anything we do to protect and sea and oceans keeps us healthy and safe. 65 years and 2 days ago, the bravery and selflessness of a few was able to change the course of a century. More than a 1000 crafts came in from the sea, bringing 160,000 allied troops to land on the beaches of Normandy. That decisive moment and act of immense bravery led to the victory of the allied forces over the Nazis. It is remembered and revered and commemorated every year because it was a victory won against all odds. If everyone on the planet took a pledge to live in harmony and peace not only with each other but with everything else on this beautiful blue planet of ours and beyond, we can rest assured of the victory – the survival of our species. Think about this and do what you can. For purposes of the management and maintenance of street lights in Pondicherry, the town is divided into five sectors, four under the responsibility of Electricity Department and one under the Public Works Department (PWD). Street lights are controlled by automatic timer. At an average there are 25 street lights per timer. PondyCAN has asked Saravanan to set the timers so that lights are switched off at 5.30 in the morning and come on at 6.30 pm. He has agreed to do it in a phased manner. The North sector begins from Perumal Koil and ends somewhere in VOC Nagar. Once we get details and maps of the other sectors, we will update this post. Concerned citizens may get in touch with the responsible engineers in their neighborhood should they see any problems with street lights (non-functioning, on at the wrong times, etc.). Should anyone have additional information, please share it with this forum.